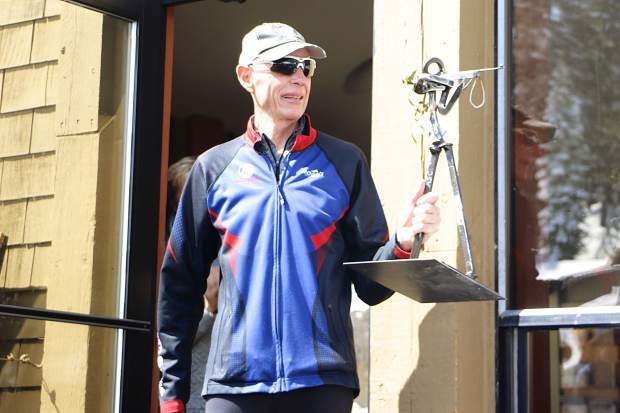 Glenn Jobe retired as Auburn Ski Club’s biathlon director and coach last month. As temperatures fail to climb above freezing and wind whips snow around the shooting range and course at Auburn Ski Club, a group of youngsters look at their coach, eyes and expressions indicating they don’t want to leave the warmth of the clubhouse. “Well, biathlon’s a winter sport,” the coach says matter-of-factly to the students, and the group, knowing there’s no arguing with the longtime head of biathlon at the club, heads out into the conditions for that day’s practice. The lesson is simple but it’s one of many Glenn Jobe has imparted upon generations of Nordic athletes in the area. Jobe, who competed in the 1978 and 1979 Biathlon World Championships and also in the 1980 Olympics, began teaching cross-country skiing in the mid-70s, and has played a major part in pioneering the sport in the Tahoe area while inspiring countless winter sports athletes. For most of this past decade, Jobe has been serving as the Auburn Ski Club’s Nordic director and head coach, helping grow the program from a handful of young racers to one that regularly produces athletes that qualify for the Youth / Junior World Championships. Following the final biathlon race of this past season at Auburn Ski Club, Jobe stepped down as director and coach, and while he’s officially retired, the longtime coach isn’t about to stop offering his insight and experience to those at the club. Following the season finale on March 24, dozens of the area’s top athletes and coaches turned out at the club to pay tribute to Jobe, capping off the year with a retirement ceremony for a local icon of the sport. “When you’ve been somebody like Glenn who has influenced and enriched so many generations, generations of athletes who are grown and gone, and now have their kids back in the program because of Glenn, you can’t retire,” said Auburn Ski Club Executive Director Bill Clark during the ceremony. Clark’s prediction proved true. Just day’s after the ceremony, as new biathlon coach Brian Halligan took a small group of athletes to Vermont to compete in nationals, Jobe could be found at the club, giving instruction to the remaining members of the team. Part of what athletes have come to know Jobe for is his laconic style, which is filled with one-liners that often leave students scratching their heads. Jobe grew up on a ranch in Northern California, and it’s from that background that most of his sayings like, “ski like a long-tailed cat in a room full of rocking chairs” or “all over it like a wild soda,” come from. The work ethic instilled by growing up on a ranch stuck with Jobe as well. Those at the club would often try to beat him to practice early in the morning, but each time they pulled into the parking lot, Jobe would already be there, often in the dark with snow blowing sideways, shoveling out targets. 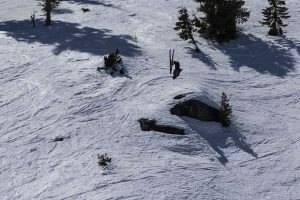 “Those winters where it would be dumping and snowing and you’d be looking at your phone to see if practice was canceled … and Glenn would’ve been up there since 5 o’clock in the morning,” said Anderson. “He would be up there digging out the targets. They’re metal targets, so if they’re frozen they’re not going to work. He’d chip out each and every single target, so that he could have the range open at 7. Following his upbringing in Northern California, Jobe attend the University of Nevada, Reno where he competed in Nordic and alpine skiing. Later on, in 2002, he was inducted into the university’s athletic hall of fame. Following college, Jobe founded both Kirkwood and Tahoe Donner’s Nordic centers and was instrumental in growing the Far West Junior Nordic Program. He also coached Truckee youngsters in cross-country, helping develop the sport in the area to what it has become today. For nearly the past decade, Jobe has been a fixture at Auburn Ski Club, showing the area’s next generation of athletes the ropes. 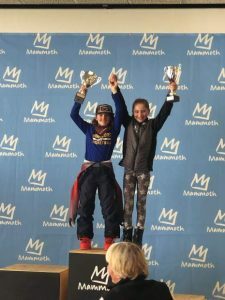 Swan has been competing under Jobe since she was in fifth grade, and like many others before her, has picked up lessons from the sport and coach along the way. In a sport where results can vary wildly, Jobe has been the consistent driving force behind the area’s biathletes, and though retired, will likely continue that role in some form or another. “I just feel fortunate to have the opportunity since the mid-70s to coach and work with a great group of coaches, athletes, and families. It’s just been fun for me to stay involved in a sport that I have a passion for,” said Jobe.